1. Pre-heat the oven to 200°C/400°F/ Gas Mark 6 2. Wrap the pitta breads in foil and place in the oven for 5 minutes to warm through. 3. Chop the chicken breast slices into small pieces and add to a bowl. Then take the rest of the ingredients and add to the bowl and mix together. 4. Take the pitta breads out of the oven and cut them in half, gently making a pocket. 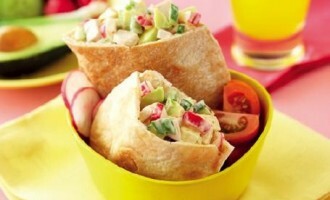 Stuff them with the chicken salad mixture and serve.